From higher education to healthcare, media to manufacturing, and government to technology, Mediacurrent has seen the digital challenges—both similar and distinct—faced by the different industries we serve. Every business has one essential goal in common: the desire to achieve higher revenue and faster growth. But many companies struggle to align their people, processes, and technology to achieve this goal. 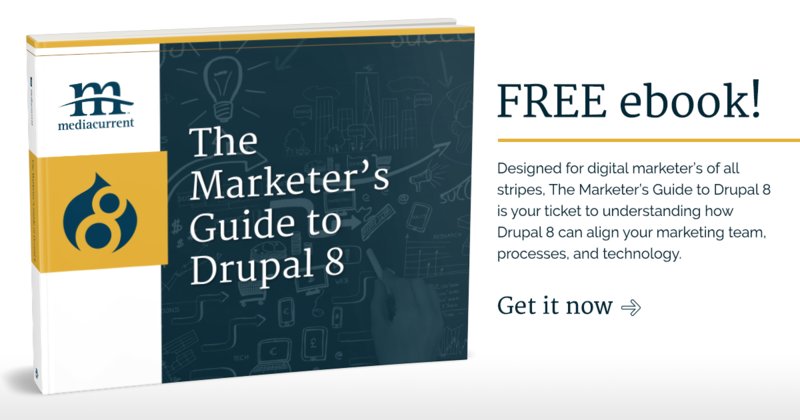 The Marketer's Guide to Drupal 8 is designed to share thought leadership, best practices, how to's, do's and don'ts for marketers at organizations that utilize Drupal 8 or may be thinking about moving to Drupal 8. What, Why, and How of moving to Drupal 8. Actionable worksheets that you can use to help you determine whether your company is ready to migrate your website to Drupal 8. How to leverage Drupal 8 to increase revenue and attain other business goals. We hope this blog series will be your ticket to understanding how Drupal 8 can help bring your site to the next level and how to maximize the value of Drupal 8 if you already have it. To start, let’s get on the same page about one of the most-buzzed-about terms on the marketing block, digital transformation strategy. In practice, the phrase is used to showcase augmented reality (AR) and virtual reality (VR), to discuss the importance of a remote workforce to explore how large enterprise organizations can leverage inbound marketing tactics to transform their digital presence. Digital Transformation may have hit its tipping point of overuse but it’s more just another fad—there are some important concepts behind this trend. When we’re talking about true transformation within an organization, we’re talking about a paradigm shift for senior leadership and usually a full culture shift. This shift means your entire organization will need to take a hard look at your strategy and KPIs for the coming year (and beyond) to understand how changes in technology or new technologies can be used to get you closer to your goals. Start by defining the core goal of your transformation initiative. Is it improving your culture across an international organization with locations in several countries? Is it implementing systems to improve manual processes? Is it creating a new website that aligns more closely with your ideal buyer’s journey? Revisit your strategic goals with the mindset of using digital technology to help you accomplish those goals more effectively and efficiently. You’ll find ways to improve operations, branding and ultimately, revenue generation and create an actionable roadmap that can get you there. Depending on the size of your organization, getting this group in the same room may be a challenge. Once the discussion begins, the foundation to build buy-in is set, and the collective mindset starts to shift. When you hear “digital,” it’s very easy to consider this as simply a technical challenge. Should your digital transformation strategy aim to leverage the possibilities and opportunities of new technologies and their impact faster, better, and in a more innovative way? Absolutely. It’s also a chance to reimagine your digital properties as a single “system” that shares data and functionality. Enter Drupal 8. Drupal 8’s API first technology makes true integration of your digital ecosystem (think marketing automation, CRM, and all the tools in your marketing tech stack) possible and clearer than ever. But it’s much more than just a technical challenge. Digital transformation is about your user’s shift in behavior. We’re living in an age where the predictions include chatbots improving user experience, blockchain technology, and virtual reality becoming a part of our daily lives. Rather than buy into the hype of the next big thing, you need to understand the needs of your users, evolve to meet those needs, and leverage the right technologies to get you there. According to Gartner, by 2020, customers will manage 85% of their relationship without talking to a human. To put this in context, this means that customers could use the web, an app or potentially even text messaging to interact with you or make a purchase -- all without ever once speaking to a person. Customer preferences and behaviors have changed and buying journeys are increasingly self-directed and digitally led. This change means companies need to find new ways, using strategy and technology, to crack the code of one-on-one digital conversations with their customers at scale. Large enterprise organizations are managing an extensive list of websites, microsites, and digital assets, each collecting and storing data points. In some cases, these individual data points are in the tens or hundreds of thousands. Organizations of all sizes are finally understanding just how valuable having current and accurate data is to their success. Still, in many cases, this data is fragmented and provides little to no value toward the company’s business goals. Because of this, many organizations struggle to understand the true value of transforming their business with a digital shift. It is paramount to identify the role that data collection, analysis, and monetization play in your company’s success and focus your transformation on improving these processes. In many cases, this collection process will require the hard task of laying out the list of data points and their location. From there, the need for technologies to consolidate, identify trends and begin your quest toward personalization will crystallize. It’s been talked before about the need for consistent analysis but it bears repeating here. In order to truly achieve transformation - the kind that allows you to look back in 6 months or 2 years and see a marked difference, you have to consistently ask yourself 2 very important questions: WHY and WHAT’S NEXT? Asking “Why” will help keep you and your entire organization laser-focused on the goals of your digital transformation efforts. Particularly in large organizations, the root of the issue is often buried beneath trivial discussions. The issues discussed may seem important at the time but in retrospect, are far less critical than the overall challenge of more customers, more engagement or other KPIs. Asking “What’s Next” challenges you to never settle. It’s a great way to keep everyone watching for the next hurdle, staying on top of the competitive landscape and keeping abreast of the newest technologies on the market. These “What’s Next” items will inform your ongoing strategy and allow you to pivot as you define the roadmap for your transformation efforts. The takeaway - digital transformation is real and it’s needed in many organizations to improve many aspects of their operations, paving the way for real change and marked improvement in efficiency and revenue generation. Now that you’re here, you’re probably asking yourself: “Am I ready for a digital transformation?” Given that a true transformation will take buy-in and work from many departments, you will be met with challenges and will need a clear path forward in order to achieve success. Yes, a full transformation that involves every team member and every digital property can be an overwhelming undertaking. Ultimately, we recommend starting with your current digital properties and taking a practical approach. Find ways to scale what is working with those current properties and begin discussions with the right team members that can help carry the torch with you. Stay tuned for the next blog in our Marketer’s Guide to Drupal 8 series! 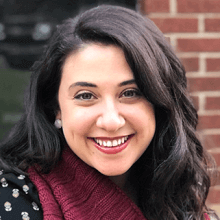 Editor’s Note: “5 Things to Know about Digital Transformation” was originally published on January 9, 2017 by Shellie Hutchens and has been updated to reflect current trends.